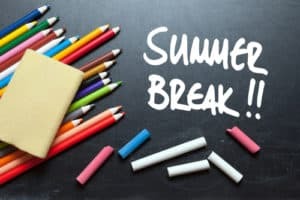 Your children are about to be home for summer break, which mean they’re about to enjoy more downtime. Since kids love to snack, this could also mean increasing their chances of developing tooth decay. Fortunately, you can help protect their smiles from cavities during summer break. Floss every night: Every night before going to bed your child should floss between each tooth. Doing so removes bacteria and food particles caught between teeth that toothbrush bristles may not reach. Flossing just once a day can decrease the risk of tooth decay and gingivitis. Brush Correctly: You should brush your teeth twice a day, once when you wake up and again before going to bed. You should brush for two minutes per session and reach every available surface of your teeth. Doing so can help protect your smile. Avoid Sports Drinks: You may think that sports drinks are a great choice for you and your kids when paying outside or participating in sporting events. However, these drinks have a high acidic content, which weakens tooth enamel and increases the risk of cavities forming. Snack Smarter: You should avoid foods and drinks high in sugar and other starches, such as soda, candy, chips, and energy drinks. Instead, drink water and enjoy snacks such as fresh fruit and vegetables, or nuts. They can provide an energy boost and don’t pose as great a risk to your smile as soda or candy. Visit Your Dentist: During the summer you can bring your kids to the dentist without missing school or conflicting with afterschool activities. A cleaning and checkup allows the doctor to examine the smile and safeguard it against cavities and other oral health concerns.